The Irving Elementary Parent Teacher Organization (Irving PTO) is a nonprofit group that includes parents, teachers, and staff that are dedicated to improving the educational experience for all students at Irving Elementary. The Irving PTO strives to encourage cooperation and communication between student’s families and the school. The Irving PTO hosts several events throughout the year to foster school spirit, raise funds for the school, and create a community that all families, teachers, and staff can feel connected to. These fun events include: Open House and Back to School Bash, Pancake Supper and Book Fair, Spring Field Day, Purple Palooza, and more! 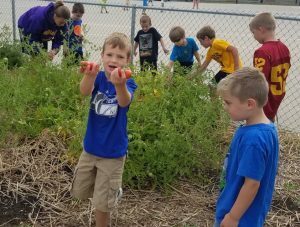 The Irving PTO raises funds to support the school through several methods including a fall fundraiser, staffing concessions for the Athletics Department, collecting Box Tops and Hy-Vee receipts, and other activities. The Irving PTO supports the teachers and staff through maintaining a supply closet, hosting staff appreciation days, securing technology and other requested classroom items, and helping to coordinate volunteers when needed. The group also works to maintain the Irving Garden, designs an annual yearbook for the students and staff, coordinates school supply kits, and offers Irving Elementary spirit gear. Irving Elementary runs on year round education calendar and our teachers, staff, parents, and families work hard to support this alternative program. 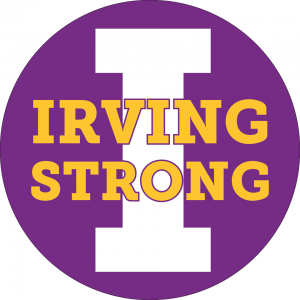 We are proud of our #Irving Strong community! The Irving PTO meets the first Monday of each month in the Irving library at 7pm (August – November, January – May). Contact us at IrvingStrongPTO@gmail.com or find us on Facebook by searching Irving PTO.